While satiation is common in the rich countries and among elites everywhere, the poor often suffer from the opposite problem: instead of too much output quantity per person, there are too many persons per output. Because this commonly occurs with respect to housing and transportation, the term used in ENL to describe this economic phenomenon is crowding. The concept is understood most readily in relation to housing. By way of comparison, the British average at the time was 0.6 people per room. What happens to the effectual value of housing when such crowding occurs? As indicated, crowding is the converse of satiation. The concept that links them is consumption capacity — the ability of consumers to convert potential value into effectual value. In satiation, consumption capacity is too low, which means that some potential value cannot be converted into effectual value and is therefore wasted. In crowding the opposite is true: consumption capacity is too high. All available potential value will be converted into effectual value, but there is insufficient potential value to go around. As well, the physical conditions associated with crowding may give rise to disease, violence, and other dangers, all of which will cause effectual value to decrease further. The overall impact of crowding on effectual value is depicted in the following figure, where consumers per output are on the horizontal axis and total (not marginal) health is on the vertical axis. Crowding is the converse of satiation: there are too many consumers per output. Crowding causes overall effectual value to peak and then decline. Note that the vertical axis represents total health instead of the usual marginal health. To make this concrete, imagine a house that can accommodate three people without negative health effects. Point C1 represents one person, who achieves health level H1 as the house’s sole occupant. Because this person's consumption capacity for housing is limited, he or she cannot extract all the potential value the house is capable of providing. This is indicated by the fact that H1 is well below the potential value line, which also means that the house's consumption efficiency is extremely low. As the number of residents rises to three at point C2, each of the two newcomers gains the same health as the first resident because there are enough rooms for all and thus no physical crowding. Total health therefore increases linearly, as does consumption efficiency. have to be shared, sanitary issues may arise, and perhaps violence will become more common as people contend for space and privileges. However, although the individual effectual health of existing residents will drop, total effectual value will continue to rise. This is because the health gained by a new resident, who previously faced the elements outdoors, will exceed the cumulative losses of the current residents. At point C* these effects have become equal and total health has reached its maximum. After this point, the negative health effects predominate and overall effectual value declines. 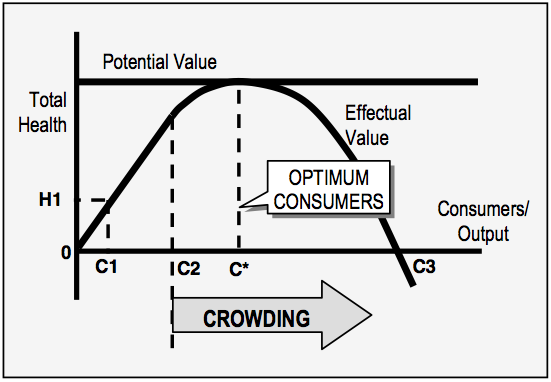 As crowding becomes increasingly severe, effectual value may decrease to zero, as indicated by point C3. If crowding increases still further, the health effect of occupying the house will become negative, implying that it would be better for people to suffer the elements outside than to endure the squalor inside. They may not wish to do so for personal or social reasons, but health will clearly suffer if such extreme crowding is permitted. The obvious solution to crowding is to increase the number of outputs, thus reducing the ratio of consumers to outputs. This is one of the main reasons why consumption must in many cases increase in the poor countries. We tend to focus on food and water for obvious reasons, but the consequences of overcrowded shelters must also be taken into account. An interesting point about crowding is that it creates conflicting interests between the individual and the group. From the individual perspective the number of consumers should not exceed the point where individual effectual value starts to decline. From the social perspective, the number of consumers should continue to rise until aggregate effectual value has been maximized. In the example shown, the individual optimum is three residents (point C2), but the social optimum is approximately five residents (point C*). The social and political implications of such inherent conflicts are wide-ranging, but they are beyond ENL's scope and are not discussed further here. The economic phenomenon of crowding is relevant to production as well as consumption. 1. Paul Harrison, Inside the Third World: The Anatomy of Poverty, 2nd ed. (Bungay, Suffolk: Penguin Books, 1979), 169. 2. See Nationmaster.com. Sources cited include the United Nations Secretariat, the United Nations Centre for Human Settlements (Habitat), and the Compendium of Human Settlement Statistics 2001.